Here is a photo of the Omphalos at Delphi. A little background on the Omphalos…Ancient Greeeks believed that the center of the world (or belly button) was located at Delphi. 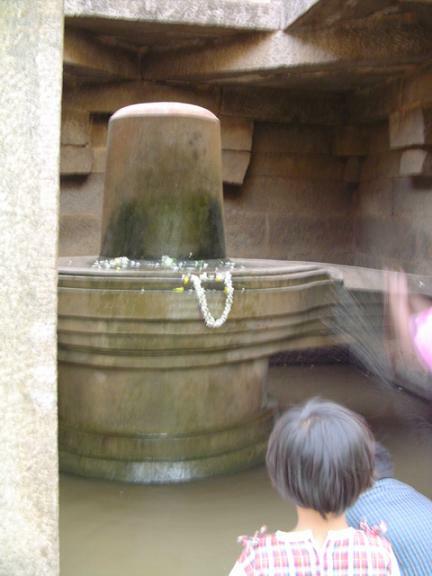 Here is a photo of a linga-a form sacred to Shiva and especially sacred to Lingayats. What do you think? Related or not? I think it is interesting that many cultures think of themselves as the center of the world. The Ancient Greeks thought Delphi was the center, the Chinese called their kingdom “The Middle Kingdom”, etc. Also, the Northern Hemisphere is always shown on top in the Northern Hemisphere and sometimes in the Southern Hemisphere it is reversed. Hello, I am friends with Mirchi, and was kinda lead on here from her blog. This is so interesting, they do look very similar. India has been invaded by the Aryan nomads from central Europe who worshiped pagan gods, though Aryan Invasion Theory is disputed today. Alexander came to India with his generals some of whom stayed back. Parts of India were ruled by Hellenistic Indo-Greek Kings for almost 2 centuries. So, Its very possible that an amalgamation of cultures took place. Watching “Malgudi Days” adds another piece to the puzzle…one of the episodes is called “The Roman Image” about an archaeologist searching for physical evidence of ties between Rome and India. I’m fascinated by all trading and influencing that went on back and forth. I think India probably influenced Rome and Greece more than vice versa because India was a more highly developed culture, but that is my personal opinion. Its been such a long time since I’ve seen Malgudi, hehe. Like you said trade routes might have played an important role. The lost city of Atlantis aka Dwarka has been found on the east coast of India. Perhaps the Indus Valley civilization might hold a answers,so little is known about it still. I think the origin of proto-Indo European languages might hold the true key of cultural influences. Hello! Thank you for your nice comment on my blog today. Interestingly, Peruvians also consider Machu Picchu the world’s navel. Thanks! I never knew that about Machu Picchu.